Another Muslim woman in the U.S. Congress? Hurrah! 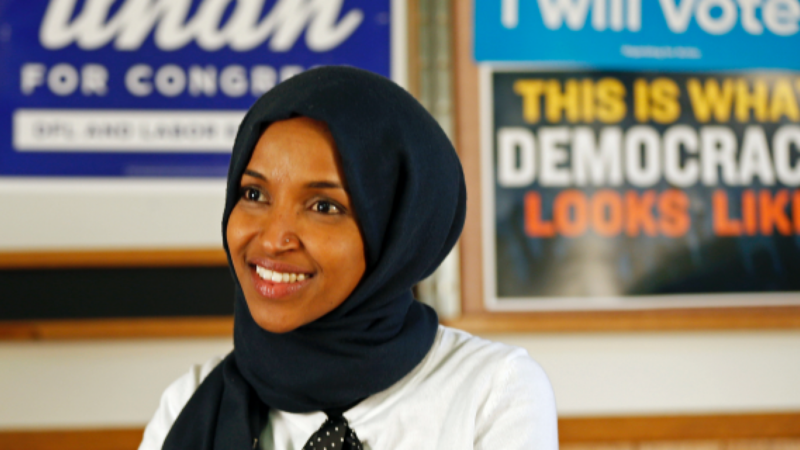 As we noted last week, the state of Minnesota has given us a new Muslim Congresswoman – namely, 37-year-old Ilhan Omar, who represents Minneapolis and surrounding urban areas, and who, after her election, publicly announced that, contrary to the impression she had left during the campaign, she is a firm supporter of the anti-Israeli BDS movement. 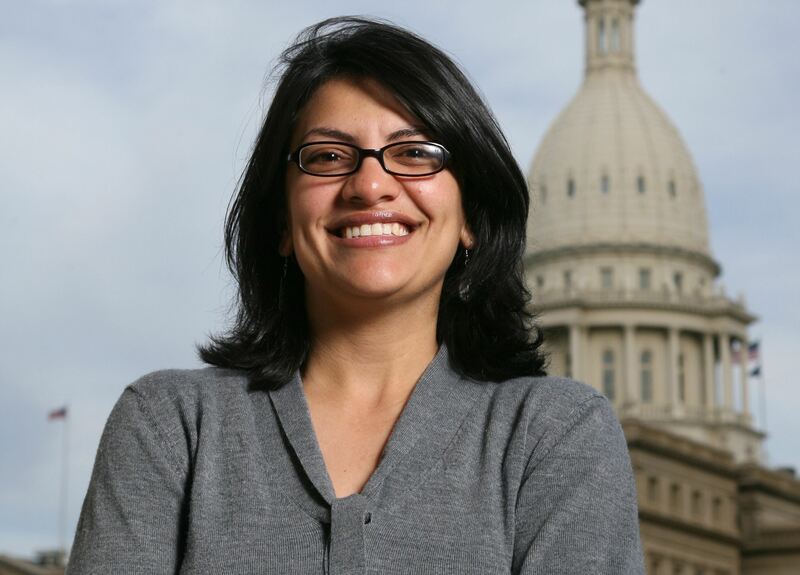 Elected to the U.S. House the same day was another female Muslim – Rashida Tlaib, age 42, who represents parts of Detroit and Dearborn Heights as well as several smaller municipalities. Tlaib, formerly a member of the Michigan House of Representatives, was the first Muslim woman ever elected to any U.S. state legislature. And she and Omar are the first two Muslim women elected to Congress. (Omar wears a hijab; Tlaib doesn’t.) Suitably enough, they represent all or part of two of the most heavily Islamized cities in the United States – Minneapolis and Dearborn Heights. Like Omar, Tlaib was celebrated by the international media throughout the campaign for being all these wonderful things: young, attractive, female, Muslim. What’s not to love? As with Omar, moreover, those same media have reflexively bought Tlaib’s self-characterization as a “progressive,” which of course even adds to her lovability in the eyes of the media. As evidence of her progressivism, they point to her membership in the Democratic Socialists of America. Yet Tlaib is also a devout Muslim – in 2014 and again on November 17 of this year, she spoke at banquets held by the Los Angeles branch of the Council on American-Islamic Relations – and of course there is nothing at all progressive about CAIR, a Muslim Brotherhood front group, or about orthodox Islam generally. until recently, moreover, Tlaib professed support for a two-state solution to the Israeli-Palestinian question; in an August interview, however, she stated that she was in favor of a one-state solution and a Palestinian right of return. Like Omar, she has also recently come out as a supporter of the BDS movement. At her victory party on Election Night, she danced while waving a flag. Not an American flag. A Palestinian flag. The eagerness of Democrat voters in the upper Midwest to put people like Omar and Tlaib in office is disconcerting. But of course they’d already sent Keith Ellison, the current holder of Omar’s House seat, to Washington, despite his background in the Nation of Islam and his chumminess with Louis Farrakhan. And left-wingers all over America have embraced Linda Sarsour, a supposed feminist and leftist who has made clear her support for sharia law and for jihad. At this point, it seems safe to predict two things. One, the number of Muslims on Capitol Hill will continue to rise, despite their failure to distance themselves from some of the more uncomfortable aspects of their faith. Two, apropos of Omar’s and Tlaib’s switcheroos on Islam, it seems a fair bet that these are only the first of many about-faces that these two women will carry off as their careers advance. There’s always a first time. Never in the history of this site have we felt called upon to revisit a subject only a couple of weeks after writing about it – or him, or her – but Alexandria Ocasio-Cortez, the charismatic 28-year-old who shook up the American political scene by beating a ten-term establishment Democrat, New York’s Joe Crowley, in a primary race for his House seat, has received so much media attention in the wake of her victory that we consider ourselves obliged to update our report on her. As we noted, Ocasio-Cortez calls herself a Democratic-Socialist. Not too many years ago, she would have been considered too far left for a serious career in national politics. After Bernie Sanders, that’s no longer the case. Staggering percentages of millennial Americans tell pollsters that they prefer socialism or Communism to capitalism. It helps that the Soviet Union fell before they were born, and that they’re either uneducated about the reality of socialism or have been fed pro-socialist propaganda by their teachers. So it is that somebody like Ocasio-Cortez is being interviewed on national media – and getting cheers from studio audiences. She’s also getting cheers from Democratic Party officials. She hasn’t even been elected to the House yet, but on July 3 Tom Perez, chairman of the Democratic National Committee, called her “the future of our party,” and Obama adviser Valerie Jarrett tweeted a thumbs-up for the ambitious young woman. Ocasio-Cortez hasn’t just been collecting endorsements, but handing them out. The Daily Beast reported that her support for Kerri Harris, a candidate for the U.S. Senate from Delaware, and Ayanna Pressley, who is running for Congress from Massachusetts, has caused donations for both campaigns to soar. The same goes for Kaniela Ing and Brent Welder, who are running for Congress from Hawaii and Kansas respectively. One of Ocasio-Cortez’s endorsements has gained particular attention. “Michigan is blessed to have Abdul El-Sayed as a candidate for Governor, and I am proud to support him,” Ocasio-Cortez tweeted on July 2. Who is El-Sayed? A former public-health director for the city of Detroit, he is a Muslim who, as a college student, was a vice president of the Muslim Brotherhood-linked Muslim Students Association. At a recent candidates’ forum, he refused to provide a direct answer to a query about sharia law – a perfectly reasonable question given his religious affiliation, and given the fact that courts in Michigan, which has America’s highest concentration of Muslims, is currently facing cases of female genital mutilation and honor killing. This, then, is a man whose political career Ocasio-Cortez is championing. Need we say more? Well, given the degree of attention she is receiving, and the amount of new information that is coming out about her by the day, we’ll probably find it necessary to revisit this rising socialist star yet again in the very near future.